When upgrading to lowering springs it’s a great idea to at the same time swap out the factory rubber spring isolator bushings with these high quality polyurethane units which offer better performance and longevity over the rubber bushings that are usually worn when removed. 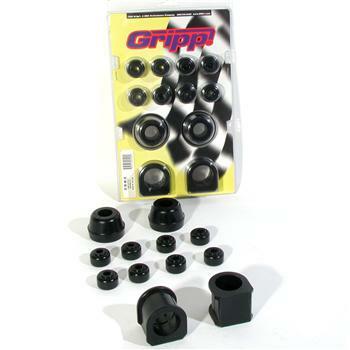 All our Gripp polyurethane bushings are molded from the highest quality graphite impregnated urethane and are perfectly fitted for an easy install. These polyurethane rear axle pinion snubber bushings are recommended with our Gripp lowering spring kits as they deliver the proper height for the new lowered stance. These polyurethane offset steering rack bushings are recommended when lowering your Mustangs ride height to ensure proper geometry and will also improve steering response over the stock rubber units.